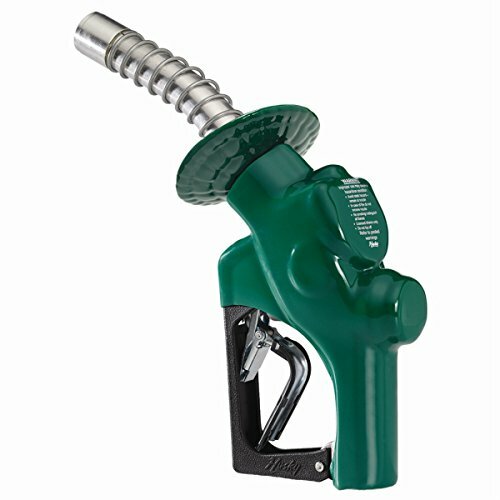 The Husky 173310N-03 New VIII Heavy Duty Diesel Nozzle with 3-Notch Hold Open Clip, Full Grip Guard, Green Hand Guard, No. 1808 Waffle Splash Guard and Spout Bushing features an automatic shut-off nozzle for truck stop and other high volume, full-services. The spout is reinforced with thick aluminum bushing that retains spout spring and keeps spout from rounding-in. This model comes equipped with a unique Flow-Stop device that shuts off the nozzle if it falls from the fill tank or raises above the horizontal. The 173310-03 comes standard with full grip guard and waffle splashguard. The Husky 173310-03 New VIII Heavy Duty Diesel Nozzle with 3-Notch Hold Open Clip, Full Grip Guard, Green Hand Guard, No. 1808 Waffle Splash Guard and Spout Bushing comes with a 1-year limited warranty that protects against defects in materials and workmanship. Husky Corporation produces high-quality nozzles, swivels, Safe-T-Breaks and accessories for service station fuel delivery systems. For more than 60-years, Husky has been on the cutting edge of developing and manufacturing products to ensure consumer and environmental safety at the gas pump. Husky's product line features equipment for vapor recovery, conventional fueling, truck and high volume, farm and commercial and convenience store applications.